So you are in the phase of your final year in your degree and your university requires you to write a dissertation in your final semester in order to obtain a degree. But writing the Dissertation is not that easy and simple like Essay or letter, this is really something different in every perspective, in terms of objective, format, writing style and much more things are totally change. Till now you may have done many assignments in the different subjects but Dissertation is something new and change it is not a normal assignment or a final project but it is the whole subject itself and carry the equal or more credit hours than a core subject. Before starting the dissertation you must know about the format and criteria of the dissertation, it requires research proposal formation, data collection, analysis, and other technical skills. The Dissertation paper format is well structured and contains different sections which much be followed. The format is the essential requirement in any dissertation paper apart from it there are many other requirements. 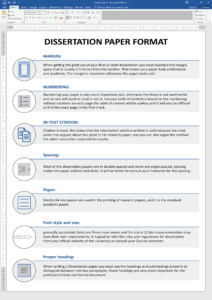 Below Dissertation Paper Format is the standard format for any dissertation and it is generally accepted but the format of different universities may vary as per their rules and regulations but these are the essential section which must exist in your Dissertation Paper. 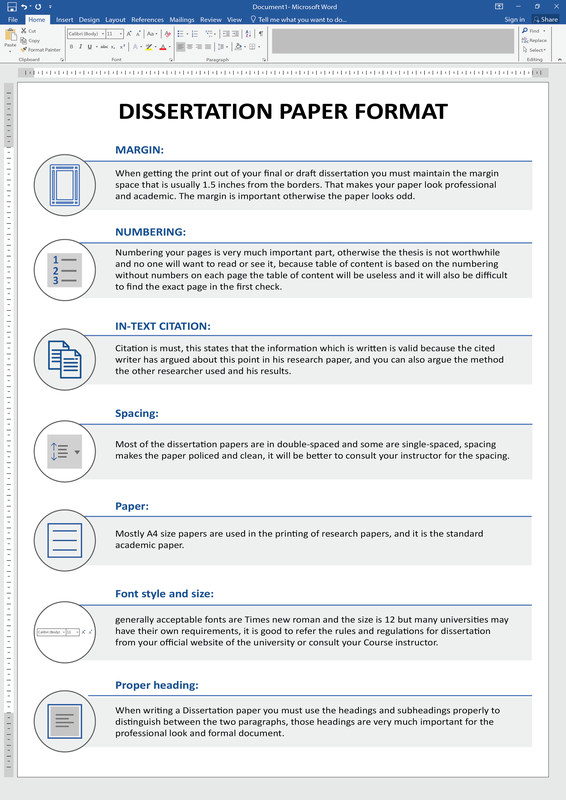 Front page/Sheet: This page is the front page of your dissertation, the simpler & the more professional pages are appreciated, this contains the Topic of your Dissertation, the name of an author, a name of supervisor, date etc. Letter of Acknowledgement: This letter acknowledges the help of those people who helped you in your research, it can be the participants who helped you in form filling, the person who helped you for anything related to research. Signature Page: This page is added in the final Dissertation when it is submitted for the publication or the university, this page entitles that all the data in the dissertation is valid and you own the all rights of writing and it is not copied from anywhere without giving credits to the sources. The signature of an author is very much important on this page. Abstract: This section contains the key highlights or main points of the research; you can consider it as a short summary, in this author has to mention the brief of a background of the study, the research methods used, and the key findings. Table of content: it is the road map of Your Dissertation paper because it can be used as a direction. 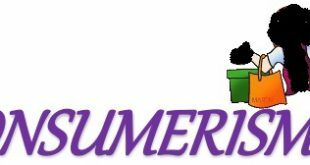 This page contains the names of headings subheadings with the page numbers, a reader can easily see that on which page the required heading is available and can reach on the exact page. It must be correct and easy to read because sometimes the committee or reader doesn’t read full research page by page but they look for the main points and they find those points by reviewing the table of contents. Introduction: This is the first chapter of your dissertation, this describes the background study of your research and also defines and argue that why you have chosen the specific topic and what the important things in your topic are. This also highlights the previous researches done on the same topic and also it identifies the questions which will be answered in your Dissertation or thesis. Furthermore, this chapter is very much important and has almost 5-8 pages; also the pages can be more it has different headings and subheadings. Literature Review: This is the second chapter of the dissertation, this covers all the previous related studies in the similar filed in which your dissertation is being written. In this the citation is very much important for every paragraph you cannot write this part based on your own ideas or opinion but this is the rewriting of the old available literature. Above is the short example of literature review this just gives the idea how it is, in the thesis the mostly paragraphs are more than 150-200 words each with the proper in-text citation in the required style, APA, Harvard or as per requirement. Methodology: This is the third chapter of dissertation, in this section all the techniques, tools, Data collections methods, analysis methods and all the relevant material is added, this chapter allow the reader to understand that how this research has been conducted, which resources are used from the data collection and through which methods data is collected either this types of data collection is correct for the respective research or not. This chapter also states that how much time the author took to write the Dissertation and submit it to the respective authorities. Data analysis and Discussion: This is the main chapter of every research because this chapter is based on the analysis of data. In this chapter, technical and analytical skills are required if this chapter is not defined very well the next chapter which is conclusion and recommendation will not be completed. Many Authors face difficulty while drafting this chapter as this chapter requires the use of different analytical software, including SPSS, E view, and other statistical software. This chapter also contains tables, Graphs, Charts, and other required images. The good presentation of data is required in this chapter of Dissertation. The Author does not just attach the tables but he also has to discuss the data outputs so that a person who reads it can understand the meaning of those charts and tables. Conclusion and recommendations: This chapter is the end of thesis or Dissertation, this chapter describes the overall results of the thesis in the format of Summary and also concludes the results, this chapter also carry the Recommendation which can be useful for the future researchers and also for those who are related to the industry or topic. References: when Dissertation paper is formatted it is necessary to mention the names of authors and sources which are referred for the information. Without giving credit to them the paper can be considered as Plagiarised and that is not acceptable in any condition as this is against the academic policies. Most universities require the Turnitin report which states the percentage of words which are copied in the whole dissertation, it is very much important to meet the criteria of Plagiarism. This reference chapter is the list of all research papers and authors who were read during the write up of the dissertation. Appendix: This section can be used to add the Questionnaire, any graph, any photo or image for the references etc. Margin: when getting the print out of your final or draft dissertation you must maintain the margin space that is usually 1.5 inches from the borders. That makes your paper look professional and academic. The margin is important otherwise the paper looks odd. Numbering: Numbering your pages is very much important part, otherwise the thesis is not worthwhile and no one will want to read or see it, because table of content is based on the numbering without numbers on each page the table of content will be useless and it will also be difficult to find the exact page in the first check. In-text citation: Citation is must, this states that the information which is written is valid because the cited writer has argued about this point in his research paper, and you can also argue the method the other researcher used and his results. Spacing: Most of the dissertation papers are in double-spaced and some are single-spaced, spacing makes the paper policed and clean, it will be better to consult your instructor for the spacing. Paper: Mostly A4 size papers are used in the printing of research papers, and it is the standard academic paper. Font style and size: generally acceptable fonts are Times new roman and the size is 12 but many universities may have their own requirements, it is good to refer the rules and regulations for dissertation from your official website of the university or consult your Course instructor. Proper heading: When writing a Dissertation paper you must use the headings and subheadings properly to distinguish between the two paragraphs, those headings are very much important for the professional look and formal document. Below it is outline of Dissertation Paper that will help you to make your paper in proper format. After making all the things perfect you will need to get the print out of final paper so that you can submit it to your course instructor or you can submit it to the publication press or committee, it is important to get the print on nice and quality pages where the font should be neat and clear the document should be presentable. After printing the Dissertation on quality papers ensure before the binding that all the pages are in the correct sequence described above or by your Research advisor because once pages get bind these cannot be used again. Get them into a formal file and read all the papers properly to avoid mistakes and submit it to your Research advisors.